- NIKITA RAYALE DASH, por Nikko Dash SA. R$ 1.790,00 em prêmios pelo SGP Sistema em Três Tambores. Campeã da 8ª Festa do Cavalo do Rancho Santa Clara/16 em Três Tambores (Amador Princ. ), etc. - RECADO BRAVO WV, por Sandstorm Keys TMR. Campeão da 1ª Prova do Rancho Sublime/16 em Três Tambores (Cavalo Iniciante). - Streak of Sixes-QH SI 102 ($480,445, New Mexican Spring Futurity [R]-G1-ntr, 300 yards in 0:14.994. - Sixy Chamisa-QH SI 104 ($350,095, New Mexico Classic Futurity [R]-G2, etc.). - Kc Royal Flush-QH SI 101 ($349,349, New Mexico Cup 870 Championship [R], etc.). - Moonifisant-QH SI 99 ($201,484, New Mexican Spring Futurity [R]-G2, etc.). - Moneys a Maker-QH SI 91 (at 2, 2017, $193,719, New Mexican Spring Futurity S. [R]-G2. 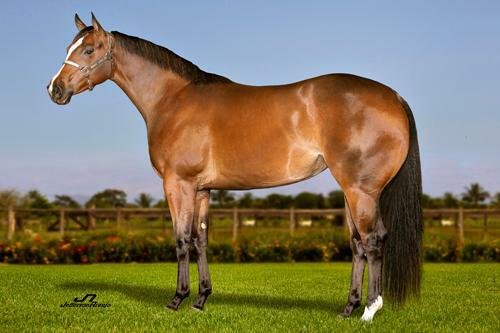 - Sixes Liaison-QH SI 102 ($169,524, Sam Houston Futurity-G1, etc.). Sixes Royal AAAT 101 ganhador de U$ 384,977 melhor macho nas pistas de corrida filho do Royal Quick Dash. Com apenas 4 geracoes corridas seus filhos ja ganharam U$ 4 milhoes com destaque para Streak Of Sixes ganhador de U$ 480,000. SI 98 (f. by First Down Dash-QH). **Straw in My Corona-QH SI 88 (g. by Strawfly Special-QH). Winner at 2 in QH races, $6,555, Register of Merit. Last raced in 2006. SI 88, by Chicks Beduino-QH. ***SIZZLIN RED CORONA-QH SI 107 (c. by Fishers Dash-QH). 11 wins, 2 to 5 in QH races, $125,012(USA), Superior Race Horse, Canada Hi-Point Aged Stallion Register of Merit, All Canadian Futurity-ntr, 300 yards in 0:15.430, Canada Juvenile Challenge, AQHRA Aged Series Enerpan AQHA ChampionshipSprint S., AQHRA Aged Series Classic S.-ntr, 400 yards in 0:19.630, AQHRA Aged Series Championship Sprint, Jim Munro Classic S., Gerry Goning Classic S., 2nd Canada Championship Challenge-G3, etc. Last raced in 2007.